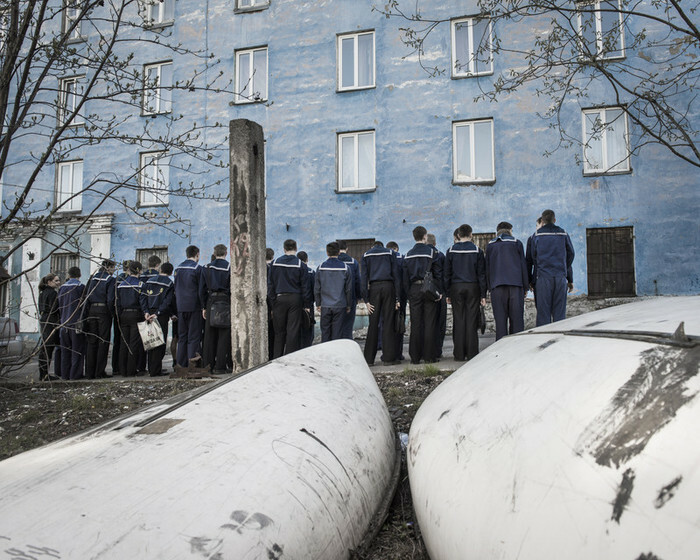 In the far north of Russia, beyond the Arctic Circle, the town of Murmansk has been training future navy officers since the 1950s. 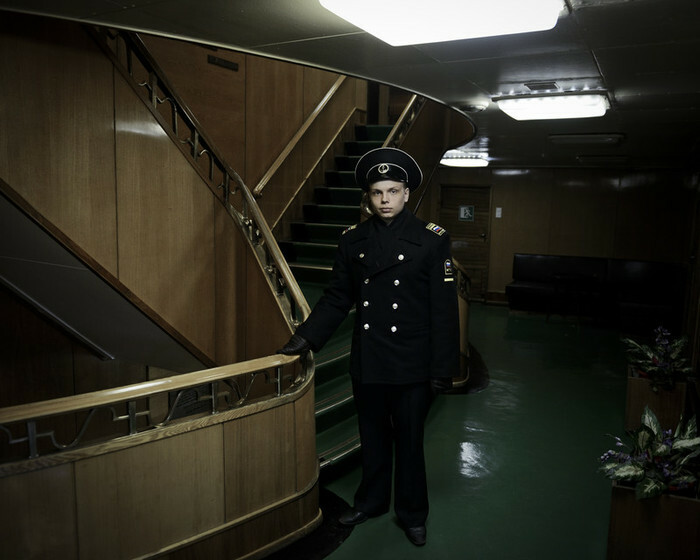 Around 1,500 kilometres from Moscow, Dima, Sergei and Maksimilian, young cadets of the Navigation Faculty, learn the rudiments of a sailor’s life. 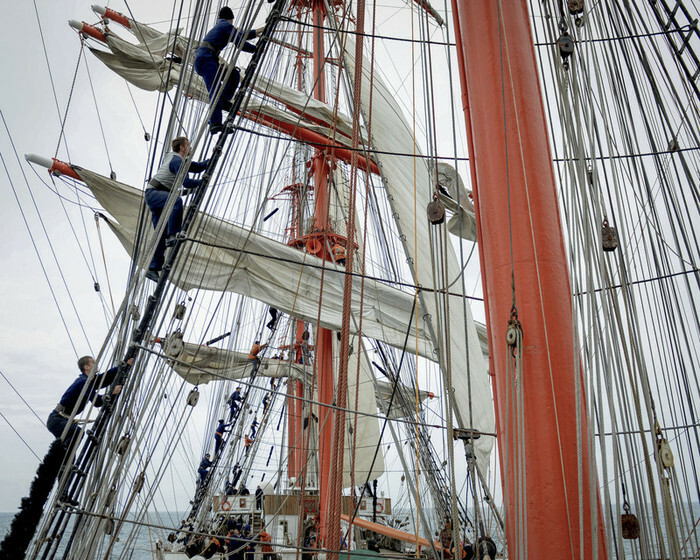 To celebrate Russia’s 1,150th anniversary, the president of the university has launched an ambitious (and lucrative) project for his students: to embark on an eighteen-month long world tour on board the Sedov, the biggest sailing ship in the world. Some towns feel like the end of the world. Murmansk, a dilapidated Soviet port city is one of them. Bathed in the dusk light of the Arctic, its Stalin-style architecture stands along the Kola fjord by the Barents Sea. The murals decorating the concrete towers are a reminder of the apparatchiks’ ambitions of the time: to populate the great north with a maritime industry. Soviet leaders set up fishing and navigation universities just after the war, to achieve their goal. Even though nowadays the city’s mainstay is mostly off-shore gas drilling, port activity remains an important economic hub. The dozens of cranes that stand along the city’s industrial harbour are witness of this. Further into the port, between the old icebreaker « Lenin » and a cargo ship, stands one of the largest sailing ships in the world: the Sedov, a four-masted ship converted into a training ship. This former German sailing ship became the property of the USSR at the end of war when the allies shared out the 3rd Reich’s flotilla. At the fall of the Soviet Union, the boat changed ports again and was anchored in Murmansk, where it became the property of the state university. The institution, located not far from the port, dates from the 1950s. The few recent renovations haven’t totally erased traces of the past: an outdated smell still lingers in the corridors. This lengthy maze, lit by neon lighting and designed to keep out the polar cold, displays portraits of past rectors and illustrious captains of the northern flotilla. Maritime maps, yellowing with age, and some murals of the Sedov are hung here and there. In the midst of this almost hostile environment from another era, cadets in uniform go from their dormitory to their classrooms, mingling with students from other university departments. It is May and some of the students have already finished their exams. At the feet of Alyosha, the gigantic concrete statue that towers over the city, some cadets are celebrating their graduation and gazing at the port. 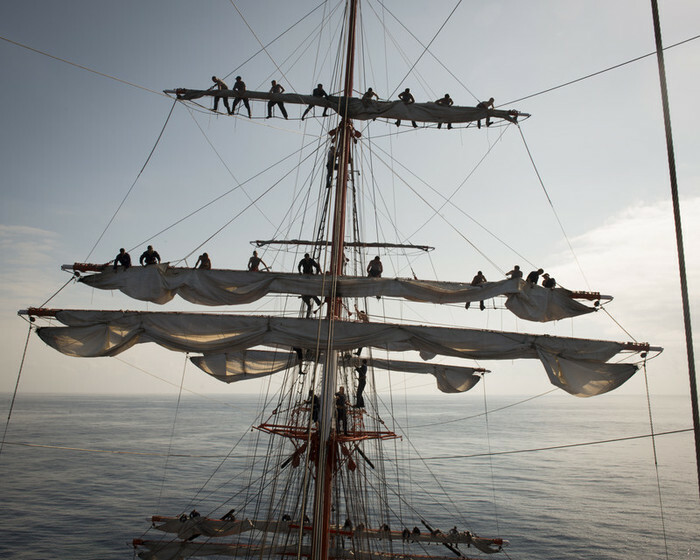 Soon some of them will board the Sedov and sail for Saint Petersburg, beginning their round the world trip from the old Russian capital. An 18-month trip that will carry the young cadets over 3 oceans and to 21 countries.